To enable OAuth support for your client application, First we need to register our application on WSO2 Identity Server. Goto Management Console and Enter your username and password. By default its “admin”. Click Main button and then OAuth in Manage menu. Click on the Register New Application link on the OAuth Management page. Select OAuth 2.0 as the OAuth Version. Enter Application Name and your Callback Url. For this app to work use http://localhost:8080/playground/oauth2client. 5. 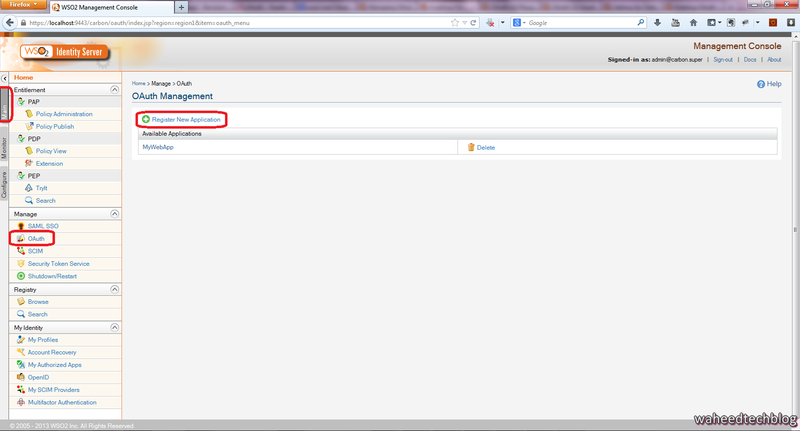 Click on Add button , you will see your application under the OAuth Management Page. 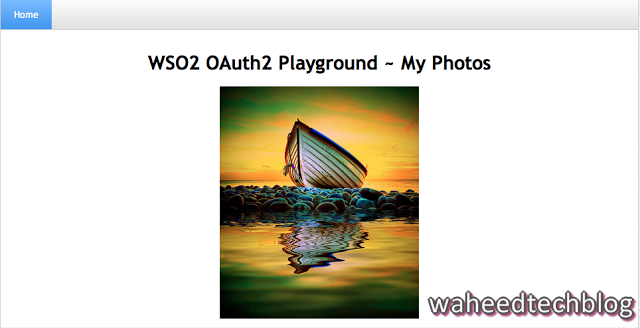 Click on the WSO2 application and copy the Client ID, Client Secret, Access Token URL and Authorize URL. We need these values for our web app. You are done with the registration part..!!! Download the sample app from here and host it in Tomcat. You can see the app running at http://localhost:7070/playground. Select the Grant Type as “authorization code”. Enter Client Id , Authorize Endpoint that we got while registering our Application. Scope is Optional and click on Authorize. 3. WSO2 Identity Server requests access to noscope, After login click on Approve. 4. You will get authorization code, Now enter the value for the Access Token Endpoint and Client Secret and click Get Access Token. 5 . Once you get access token, Click on “Get Photo”.